New York, N.Y. In World War I, there was a group of over 2,500 American men who did not join the U.S. Army. U.S. volunteers who came to France in WWI did so starting with 1914, three years before their country entered the war and began a draft. Many volunteered to staff ambulances with the American Field Service (AFS) – on the battlefields of France. They were busy. More than 15 million people died, with that many more wounded. The War to End All Wars was bloody. The ambulance drivers vowed at the end of that Great War to do whatever they could so that it would never happen again. American Field Service ambulance drivers in France. The War to End All Wars was bloody. The ambulance drivers vowed at the end of that Great War to do whatever they could so that it would never happen again. A remarkable number of well-known authors were ambulance drivers during World War I. Among them were Ernest Hemingway, E.E. Cummings, and W. Somerset Maugham. There were three predominant WWI volunteer ambulance groups: the American Field Service (AFS), Norton-Harjes, and the American Red Cross. The U.S. entered the war in 1917 and both AFS and Norton-Harjes were merged into the U.S. Army Ambulance. The American Field Service started as the ambulance arm of the American Hospital in Paris. Its driving force was A. Piatt Andrew, a former U.S. Assistant Secretary of the Treasury and professor of economics at Harvard. They dreamed of an exchange program between nations so that people would come to know each other not as The Enemy but rather as friends. The first exchange began formally between France and the U.S. Following the Great War, AFS sponsored the French Fellowships — graduate student scholarships for study in France and in the U.S. — which in time became the Fulbright Scholars program. AFS began to bring younger participants to the U.S., from France in 1947 and Germany in 1948. The Multi-National Program — exchanges between countries other than the U.S. – did not come until 1971. AFS Intercultural Programs, today is the preeminent high school exchange program in the world, ahead of Youth for Understanding and the Rotary Exchange. It is also the world’s oldest and largest high school exchange program. When I was in high school, I applied and was accepted as an AFS exchange student to Germany. I learned about “tolerance” from my AFS host father. My American family hosted a young woman from Japan when I was in college. The motto of AFS, taken from Sanskrit, is “Walk together, talk together, All ye people of the earth, Then and only then Shall ye have Peace.” This saying has directed my life. 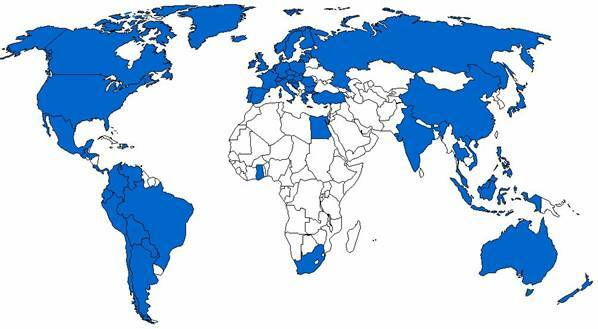 AFS operates in 80 countries around the world (blue)..
Thirteen thousand students are exchanged each year, between 80 countries. Many world leaders are among the 400,000 returnees. AFS is not Ameri-centric. More than 60% of exchanges are outside the U.S. The alumni are impressive. The former present of Colombia, Cesar Gaviria. The former interim president of Bolivia, Eduardo Rodriguez Veltze. The late Jaroslava Moserova of Czechoslovakia served as Vice-President of the Czech Senate. She was hosted in North Carolina. Brian Atwood, dean of the Hubert H. Humphrey Institute of Public Affairs who served as director of USAID during the Clinton administration, was an AFS’er, as is my friend R. Nick Burns, current Under Secretary of State. AFS alum and Mayor of Hiroshima, Tadatoshi Akiba, with author at U.N.
AFS alumni may be found around the world and in space. Astronauts Cady Coleman (U.S.) and Hans Schlegel (Germany) were AFS’ers. The Mayor of Hiroshima, Tadatoshi Akiba, was in the U.S. with AFS at the beginning of the 1960’s. The internationally known political scientist and former president of Columbia University, Grayson Kirk, was an AFS French Fellow. Dr. Kirk consulted the U.S. State Department on international politics in the 1940’s and helped create the United Nations. For a time, he was president of the Council on Foreign Relations. Tens of thousands of AFS’ers may be found on Facebook, including this writer. I would not be who I am today — and the organization I founded, Orphans International Worldwide — would not exist, if it were not for my life-impacting experiences with AFS. If you would like to host an AFS student, an act of kindness that will provide far more than it costs, contact AFS USA. There is an excellent video available on YouTube. The worst part of being an exchange student is leaving. I say good bye to my German family. Photo: author. If you or your child would like to be an exchange student, now is the time to act. 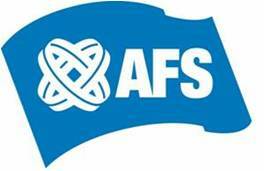 AFS maintains a heavy 2.0 web presence. Read an AFS blog, ask an AFS’er on FaceBook, or check out a photo gallery of AFS’ers in action on Flickr. Given the conflicts between Israel and Palestine, Sri Lanka and its Tamils, China and Tibet, it is obvious that we need to walk together, talk together even more. High school is the best time to begin this journey. For me, AFS was the best path. Edited by Rebecca Nutley (Australia). Originally published in The Huffington Post, May 6, 2009.